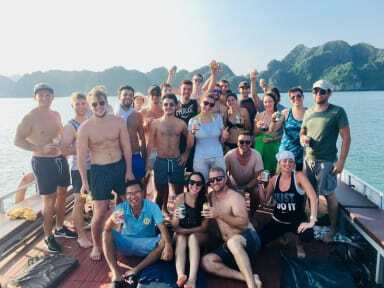 Full Moon Party Hotel i Cat Ba Island, Vietnam: Reservér nu! Staff is very helpsome and all of them speak english. There is a good size box to lock a medium size bag in. Curtains for the bed if you want privacy. The sleeping area is on 4. or 5. floor, so the noise level is nice low for those who want to sleep. Facilities such as bath is descent, warm water, towels and even soap sometimes. Overall a good place to stay for a couple of nights if you are visiting Cat Ba. We stayed 2 night at the hotel which was more bad than even some of the badest hostels. The room was dirty and there was a constantly noice because of a constructing in the neighbor building. Even though it should be a party hotel there isn’t really any place to go partying at the hotel. The breakfast wasn’t really eatable and the staff there were impolite.